"Mandavi's wife has demanded a CBI probe into the attack. If the chief minister (Bhupesh Baghel) does not want to hide anything, then he should get the incident probed by the central agency. A neutral probe should be carried out into the attack," Amit Shah said. Amit Shah alleged that Naxals are rising after the Congress government was formed in the state. "Our MLA Bheema Mandavi was killed in the Naxal attack. I pay my tribute to him and pray that the departed soul rests in peace. It was not a normal incident and it seems to be a political conspiracy," Mr Shah said. Mr Shah also targeted Mr Baghel for banning the CBI from investigating any fresh cases in the state without seeking the state government''s consent. "Why is Bhupesh Baghel so afraid of the CBI? The Raman Singh government had never banned the CBI," he said. The BJP chief also alleged that Naxals are rising after the Congress government was formed in the state and said Congress government has decided to practice politics along with Naxals in future. Slamming Omar Abdullah over his demand for a separate PM for Jammu and Kashmir, the BJP chief said Kashmir cannot be separated from India till the last BJP worker was alive. "Omar Abdullah has advocated for a prime minister in Kashmir. Do you think it is possible that a country can have two PMs? They wanted to separate Kashmir from India. Rahul Gandhi is silent over it. 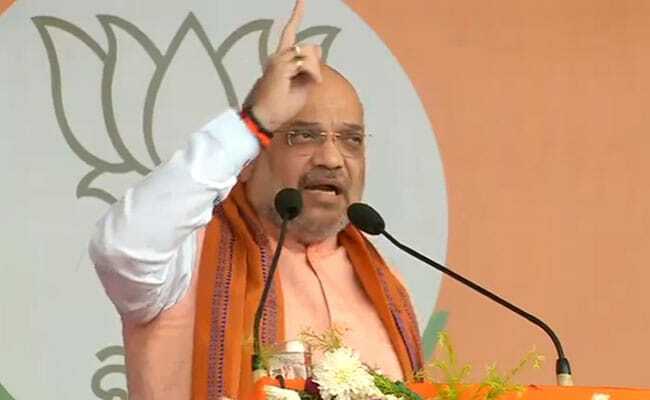 He should clarify whether he supports or opposes Abdullah's statement," Mr Shah said, adding, "Kashmir cannot be separated from India till the last BJP worker is alive." During the 10 years of UPA rule, when terror attacks happened, no reply was given. But when Pulwama terror attack took place, the Indian Air Force carried out air strike and demolished the terror camps inside Pakistan," he said. "At a time when the entire country celebrated the air strike, there was grief in Pakistan and in the office of Congress," Mr Shah claimed. "Guru of Rahul Gandhi, Sam Pitroda, says talks should be held with them (Pakistan)...But reply of bullets will be given with shells. Vote bank cannot be bigger than the nation's security," he said. Highlighting PM Modi government's various welfare schemes, Mr Shah said, "What the Modi government has done in 55 months, was not done even in the 55 years of the Congress rule. The 10-year-rule of the UPA was dipped in corruption and scams to tune of 12 lakh crore was committed during that time. Growth does not take place by raising development slogans, but when there is compassion for poor in the heart, he said. The BJP had won 10 seats of the 11 Lok Sabha seats in Chhattisgarh in the 2014 Lok Sabha election, Mr Shah said, and exuded confidence that the party would emerge victorious in all the 11 seats this time. In the last three Lok Sabha polls - in 2004, 2009 and 2014 - after the formation of Chhattisgarh, the BJP had fared well by winning 10 out of 11 seats all the three times. BJP denied tickets to all its all 10 sitting MPs in the state this time after suffering a massive defeat in last assembly polls. The saffron party has fielded its state general secretary Santosh Pandey in Rajnandgaon Lok Sabha constituency which will go to polls in the third phase on April 23.